Defending champions India will take on Pakistan on September 19 in Asia Cup 2018, as per the schedule confirmed by ICC. India will play back-to-back games as they would be taking on a qualifier on September 18. 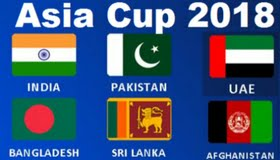 Asia Cup 2018 will be held in the UAE from September 15 to September 28. Bangladesh will face Sri Lanka in the opening game in Dubai. India, Pakistan, Sri Lanka, Bangladesh and Afghanistan are the other confirmed teams. The qualifiers battling out for entry include UAE, Singapore, Oman, Nepal, Malaysia and Hong Kong. Group A features India, Pakistan and the qualifier while Group B includes Sri Lanka, Bangladesh and Afghanistan. The sides from each group will qualify for the Super 4. The final will take place on September 28 in Dubai.